One of my favorite food pairings is potatoes and sauerkraut. Itâ€™s like they were made for each other. Potatoes are starchy, blank canvases for flavor while sauerkraut is tart, salty, crunchy and full of flavor. Theyâ€™re perfect for each other. We make a lot of salads and nourish bowls in our house, so weâ€™re always finding ways to mix it up a bit. Lately Iâ€™ve been trying to eat more sweet potatoes, and this is now my go-to recipe to make that happen! I usually toss quinoa or brown rice pasta into my salads when Iâ€™m craving a bit of starchiness, but potatoes are perfect for this too. Kale is my absolute favorite green leafy vegetable for salads and nourish bowls. I learned this week though, that its quite a dirty conventional crop so weâ€™ve been buying the loose organic kale from Whole Foods Market. Weâ€™re always there delivering our fermented veggies, so itâ€™s super convenient to stock up on organic, plastic free produce. This recipe includes my absolute favorite homemade salad dressing that I put on EVERYTHING, so I definitely suggest using it on all kinds of salads and nourish bowls. Enjoy! Cube your potatoes. I like to cut mine into smaller cubes, but you can do whatever size and shape you want! Lay out the potatoes in a single layer on the parchment paper-lined baking sheet. Toss in olive oil, Cayenne pepper and salt. *Note: adjust cayenne pepper amounts to taste. Add more if you like it spicy, add less if you don't. Bake at 425 degrees for 15 minutes, then flip and bake for about another 10 minutes until they are golden brown and slightly crispy. While the potatoes are cooking, start massaging your kale with the onions, about 2 tablespoons of apple cider vinegar and 1/4 cup of Cultured Guru Sauerkraut. I like to massage the kale using my hands. Massage until slightly wilted and soft. This makes the kale eaier to digest and the nutrients more readily available. Once the potatoes are done cooking, remove them from the oven and allow them to cool for about 10 minutes. 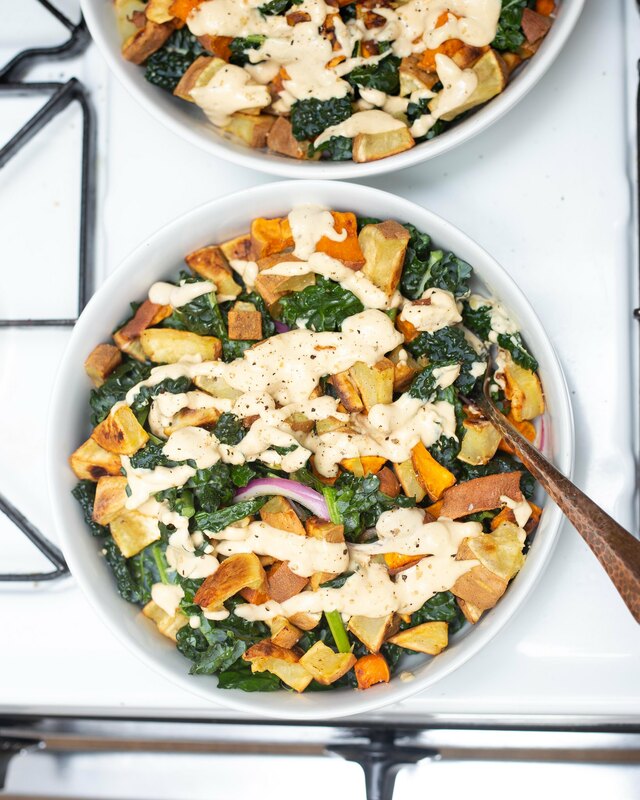 Add the massaged kale to bowls, top with potatoes and dressing. Enjoy!